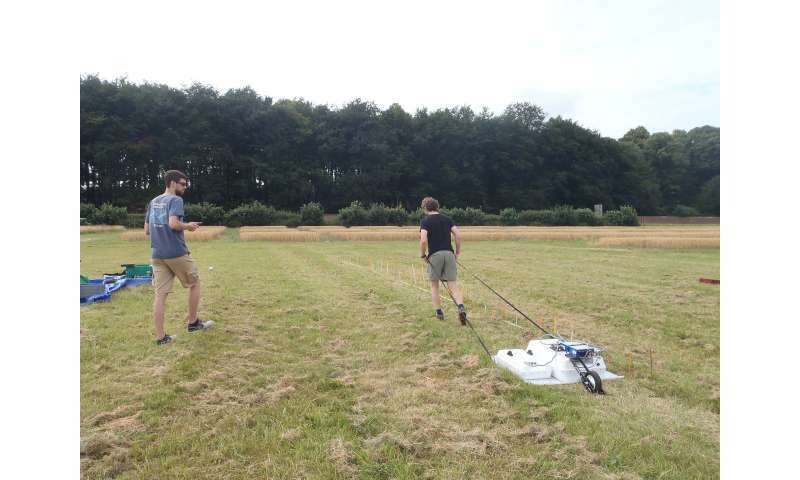 Algeo stands on the left with a tablet while his advisor, Lee Slater, drags ground penetrating radar equipment over the soil's surface. Credit: Chris Watts, Rothamsted Research. Ground penetrating radar isn't something from the latest sci-fi movie. It's actually a tool used by soil scientists to measure the amount of moisture in soil quickly and easily. "It's a very common tool in research, agriculture, engineering, and the military for looking at buried objects and measuring water content," Algeo explains. "One of its main benefits is that it is very fast. One example is a tool with a wheel that allows the radar to take measurements as you drag it along the ground. In this way, you can very quickly take measurements across a large field or a line that's miles in length. Radar can be used quickly over a large area to answer many different questions." The technology can be used to find underground tunnels, bedrock, or cracks of metal in the supports of a bridge. In terms of soil, the questions can vary. How much water is near the surface? How does it vary throughout a field site? The near-surface water content can affect climate, so it's important for computer-based climate models as well. Being able to measure soil moisture in a field can allow farmers to optimize water usage so they aren't using too much or too little, especially in dry areas where water is limited. Looking at the very shallow subsurface allows farmers to test the efficiency of their irrigation systems. 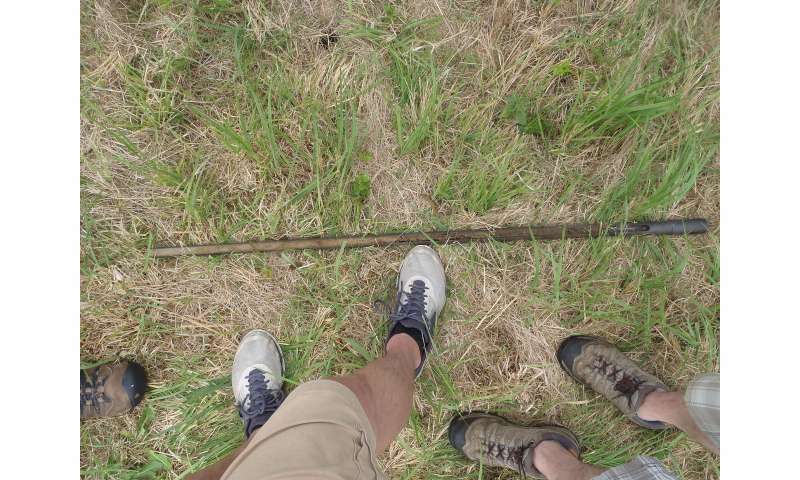 A soil core, with researchers' feet to give perspective. Credit: Jonathan Algeo. How does it do this? "Ground penetrating radar uses two antennae. One puts out a signal and another receives it," Algeo says. "The outgoing signal is similar to a microwave or cell phone signal. That signal travels in all directions, but most of the energy is directed into the ground. When there is a buried object or a change in material, the radar signal reflects back to the surface, where it is picked up by the other antenna." The equations and methods researchers use to estimate water content come in many different forms. Algeo's recent research tested which ones were best at estimating water content. The equations analyze the early time signal. These are the first radar waves to get back to the receiving antenna after going through just the top of the soil. The strength of this signal changes based on the water content of the top of the soil. It can be measured even in clay-rich soils where radar wouldn't normally be helpful. "In order for a method to get widespread use in industry, it needs to be proven beyond doubt by researchers like us," Algeo says. "We are trying to figure out all the details of where, how, and when early time signal analysis is most useful. This means users of ground penetrating radar will have another tool in their toolbox when they are trying to quickly measure subsurface water content." "Ground penetrating radar is my favorite geophysical tool because we can get such a wide variety of information from the subsurface with it," he adds. "If there is a question about the subsurface, chances are it will be able to give you some insight into what's going on."